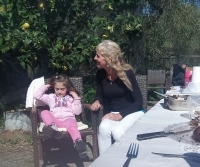 We are just back from a wonderful afternoon with Stefanos and his family... We have eaten well; very very well.... ! Lack of a shared language made no difference to the truth of a friendship, that blossomed from the moment we stepped out of a taxi in May last year, and walked up the steep driveway of ‘Stefanos Place’, to be greeted by Stefanos himself, who served us coffee at a table with a bright red check table cloth on it. The language of the heart is the most powerful of all, communicating all that is needed... The giving and receiving of Love. The way was marked with red arrows because the Corfu challenge race has taken place recently and so the path was clear and easy to follow.... Clear but steep, very steep and very beautiful... Despite the severity of the climb and the challenging terrain, it was easier than we have become accustomed to in the land of the cactus and wild horses’ of St Lucia.... Easier underfoot and not so hot…! In the end we hiked for nearly 3 hours, and had a bit of a rush to get to lunch…! We nearly reached the top of mount Pantokrator before needing to turn so that we would not be late…!